While we may be on summer break now, before we know it, textbooks, binders and agendas will once again be part of the norm. Gearing up to head back to school is the perfect time for College Gloss to address your questions about getting back into the school routine via social media, specifically Twitter. Nervous about what to wear or how to chat with upperclassmen? Don’t be! CG is here to help! We are so excited to announce our first-ever live Twitter chat on Monday, August 13th from 8-9 p.m. EST! A live Twitter chat is essentially a live conversation with all of our amazing readers and fans via Twitter, and we hope you log onto Twitter to join the conversation. We will ask questions related to going back to school for you all to weigh in on, as well as answer all of your toughest questions! Though the theme of our chat is Back to School, we also will address any relevant questions or comments you have. Everyone who participates in this chat is asked to tag their tweets with the hashtag #CGChat … let’s try to get the hashtag trending! However, this Twitter chat gets even better because CG has partnered with Rich and Famous Eyewear, a unique, trendy sunglass company, who has agreed to help us out with this chat! Rich and Famous Eyewear is going to be live chatting with College Gloss, and they've also provided a 20% off discount code: BACK2SCHOOL to use on their site. They might even be giving out some prizes, too ... but you'll have to get on Twitter during the chat to find out! 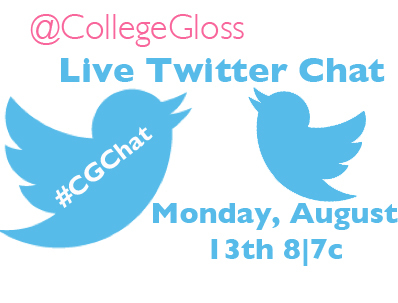 Please join @CollegeGloss and @RandFEyewear on Monday, August 13th from 8-9 p.m. EST for our Back to School #CGChat! We hope to see everyone tweeting. Want us to follow you before the chat? Leave a comment below with your Twitter handle, and we’ll follow you!